JNN 22 Feb 2014 Delhi : Conflicting reports about the coneversion of famous Indian singer Hans Raj Hans to Islam has appeared in Pakistani and Indian media, with Most confirming the news and others denying it. “I listened to the call of my heart and decided to embrace Islam”, Hans Raj Hans said while talking to Pakistan News Agency INP, Ummid.com reported on Thursday, February 20. “We should follow the teaching of Islam as it is a Religion of Love and Peace”, Hans, who is also the general secretary of Shiromani Akali Dal (SAD), a Sikhism-centric political party in India, added. Hans, one of the famous Indian singers, a popular name in Sufi Music and Punjabi folk songs, has been in a peace mission to Pakistan. He emphasized both India and Pakistan to resolve all the problems with dialogue as it was the wish of the people of both the countries. According to Pakistani news portals ‘Pakistan Affairs’ and ‘U News TV’, he said he has studied Islam very closely and started reading the Holy Qur’an. Gradually, he began to understand the essence of the divine revelation, deciding to revert to Islam and change his name to Mohammad Yousuf. Yet, sources confirmed that he will maintain his name ‘Hans Raj Hans’ for singing industry. As more sources reported the news of Hans’ reversion to Islam, Indian media quoted Hans Raj Hans’s son Navraj refuting the reports of his father converting to Islam. Navraj said that his father is unwell and is at their home in Jalandhar. Hans Raj Hans is an Indian Punjabi language singer and politician. Being famous for his classical variations in singing, he has been singing folk songs for many years. Born into a Sikh peasant family at a village called Shafipur near Jalandhar, he sings Punjabi folk and Sufi music. He has worked alongside other renowned artists such as the late Nusrat Fateh Ali Khan, as seen in the movie Kachche Dhaage. 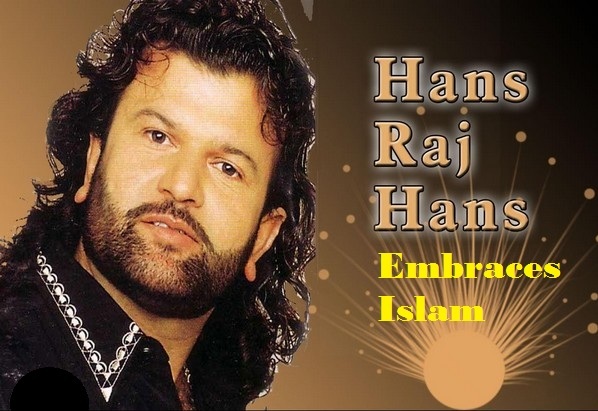 If confirmed, Hans Raj Hans would be the second Indian musician to revert to Islam in a fortnight. Last week, Chennai based music composer Yuvan had also annnoucned that he is a Muslim now. Internationally renowned musical maestro and Oscar Award winner musician AR Rahman, actress Sharmila Tagore, Bollywood’s famed creative genius lyricist-poet-screenwriter and film director Gulzar, and Bollywood actress Mamta Kulkarni have also converted to Islam in the past. This entry was posted in Asia Pacific and tagged Hans Raj Hans, Indian Singer, Indian singer Hans Raj Hans, Islam, Mohd. Yousuf, Muslim, Pakistan News Agency INP, Punjabi Songs, Sufi Music. Bookmark the permalink.